- Publisher Overcome by the Spirit tackles every conceivable question and concern about this issue, including: -Isn't it just the power of suggestion?-Aren't some people actually pushed over?-What are spiritual benefits, if any?-How good can something be that causes division and controversy? - Publisher Tackles questions and concerns raised about being ''slain in the Spirit'' with biblical wisdom, sensitivity, and practical advice. 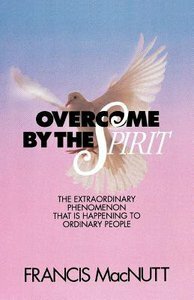 About "Overcome By the Spirit"
Overcome by the Spirit tackles every conceivable question and concern about this issue, including: -Isn't it just the power of suggestion?-Aren't some people actually pushed over?-What are spiritual benefits, if any?-How good can something be that causes division and controversy? Tackles questions and concerns raised about being ''slain in the Spirit'' with biblical wisdom, sensitivity, and practical advice. Francis MacNutt, Ph.D., who as a young Roman Catholic priest was prominent in the charismatic renewal in the 1960s, is the author of the best-selling Healing, as well as Deliverance from Evil Spirits and other books on healing prayer. He and his wife, Judith, also conduct an extensive teaching ministry through conferences, seminars, tapes, and speaking engagements. They are the founders of Christian Healing Ministries in Jacksonville, Florida.